Yup, yes, uh-huh. My recipes have been featured in a real, live cookbook that just hit the shelves! 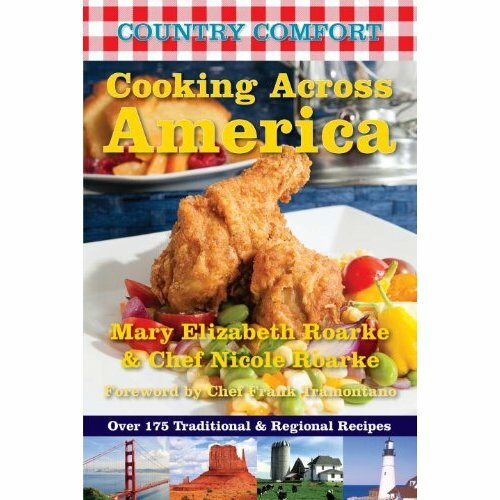 Mama and daughter team Mary Elizabeth and Nicole Roarke have published a book about comfort food across America. They've picked recipes from around the country, focusing on each region and local ingredients and cultures. When they approached me to see if I would contribute, I was psyched to add my little bit of Brooklyn to the hundreds of other recipes published! Once Upon A Time...I prided myself on how much I read. Both for educating myself and entertainment purposes. I was voracious. And it felt great. As the years went by and the kids multiplied the time for reading dwindled and dwindled. And I found that when I did snag a moment to settle in with a book or a paper my focus was hard to find. With all the responsibilities piled upon my plate in so many different categories, my down time was needed for decompressing and unwinding, I was too foggy to concentrate. That said, I do find time to get a decent amount of reading in, though it's not as much as I'd like. Unfortunately I get more reading done for work (nutrition) than for play (I love me a good Jodi Picoult or Philippa Gregory). And often friends or family send articles I want to read and they literally pile up. A Natural Guide to Pregnancy and Postpartum Health by Dean Raffelock is a smart and well written book about functional medicine and how it relates to the woman in her years of fertility. Your Extra-Virgin Olive Oil is Fake- Crazy article about olive oil and the mafia. Worth Reading! Absolute Beauty by Pratima Raichur- I saw Pratima as my Ayurvedic doctor after I had bar to help balance my life and skin. I've been using her products since along with some Ayurvedic herbs and I have to say they are amazing! I can't wait to delve into this book and learn more. That's it for now, though the pile of books I have by my bed to read is higher than I'd like to admit since I read slower than I'd like to admit these days. I'm always happy to add on (one day I'll be able to dive into them). Any suggestions?!? A while back I read Jonathan Safran Foer's Eating Animals. I definitely should have shared it with you earlier as it was absolutely brilliant and totally worth a read for vegetarians and carnivores (ok omnivores: potatoes potautoes) alike. In this book Foer inspects our country's treatment of industrialized animals and comes at it with a sharp, sensible perspective that can't easily be argued with. He covers the gamut of issues and gives a full story of what's going on behind the scenes and what ethical repercussions come with them. Foer brings these issues to the table with a biting wit that can make you laugh and cry in the same thought sequence. Presenting the book from the perspective of a parent, he is honest and strong in his moral ground and you can only praise him for his motivation, thoroughness, and dedication. Read it. You'll laugh and be a little horrified, and come back to some middle ground where you feel a bit of a better person for knowing and caring. So, basically, I've avoided writing about books I'm reading, read, or loved solely on the basis that they're not related to vegan life (unless they are like I did here and here). But I was thinking (as I often get caught up doing) that reading is a big part of who I am and it's what makes me more engaged and interesting and interested. And so is veganism. So maybe I should include some of those books that I love, that take me somewhere else, that make me deeper, fuller, better. So...every once in a while, I'll post about books that I love. So that maybe you'll love them too. Because books are worth loving. I fell in love with this book (and the whole series for that matter). It delves deep into the life of Queen Elizabeth I, her love affair, his wife, and all the drama that surrounded Tudor England. It's capturing and encapsulating. Read it in bed, on vacation, anywhere that you can truly get entrenched. This book was both surprising and moving. After reading the Tudor books I was enthralled by historical non-fiction and stumbled upon this gem. Mary Todd Lincoln was a fantastically unique, energetic, and loving character in our country's history. This book is more than worth a read, it is imperative to really knowing what goes on behind closed doors and truly learning something enchanting and valuable about our country's favorite president. It sheds a brilliant new light on who Abraham Lincoln really was and I'm almost positive you'll love him even more after reading this novel! I read this book this past summer by recommendation of my friend Lauren (who always recommends fabulous novels for me) and had a tough time with it in the beginning. It was a little dense and slow, but once I got over the bump, I couldn't put it down. It tells the story of the slave trade through one woman's incredible story. Lawrence Hill introduces us to Aminata Diallo and you can't help but feel her strength and resilience through her story. This novel both throws you down and picks you up. It speaks as much to the human spirit as it does to the evils that history has dealt us, but all-in-all, Aminata can teach us about living your life to it's fullest against all odds. It's inspiration at it's best. I'm really needing a distraction these days! Any suggestions?!? Though I don't use cookbooks much to follow recipes, I do love to have a bunch of them on hand for inspiration. Sometimes, when I'm in the cooking mood, but don't have a specific meal in mind, I like to pull out 4 or 5 cookbooks to flip through for new ideas or to remind me of old ones. One of my new favorites is Alicia Silverstone's The Kind Diet. I read her book a while ago and was superinspired! The first half of the book speaks to why being vegan is so important both for our bodies and our planet. She writes simply and covers all the bases. It's definitely worth a read! The second half of the book is filled with her favorite recipes and most of them are easy, delicious, and relatively innovative. After the book hit the stores, Alicia also launched a fabulous website that is part blog, part forum, and totally informative and motivating. You can check it out at www.thekindlife.com. I read it almost daily and it's introduced me to so many new products, recipes, and organizations. Shady Day Daily Sun Protection Wipes SPF30. I can't stress how important SPF is. I wear it year round. While I LOVE the sun and being outdoors (especially at the beach), the sun is a killer. Literally. For all of you who love to bake in the sun under layers of oil (you know who you are) think: sun spots, leathery skin, wrinkles, melanoma, cancer, chemotherapy, I could go on. I've decided smooth, soft, healthy skin trumps that any day. Join the bandwagon! And it's so easy with these amazing wipes. They smell good, feel good on your skin, absorb easily, and are paraben-free and all natural. You can pick them up at Ricky's (that's where I get mine and I always stock up when I see them). I even use them on Avital! Aloe (just in case). Lily of the Desert makes a great, organic one! My superawesome Calypso St. Barth Cowboy Hat for reading in the sun and saving my eyes. I read this book (along with a million others (read:20ish)) when I was pregnant with Avital. Lynda Fassa does a wonderful job of explaining the importance of being "green" for ourselves and our fetuses, but it's worth reading even if you're not pregnant. She covers the gamut of topics any girl would and should be concerned with and suggests ways and reasons to avoid harmful chemicals and the such. She enlists experts in each of the fields to contribute brands, home remedies, and tips. I found it not only enlightening, but extremely motivating and helpful. It's a short and easy read. So pick it up! Lynda also does a ton of talks around the country and has a great story of her own. Here's an interesting article and interview with her from Planet Green. Have a great weekend everyone and enjoy the forecasted fabulous weather! Ok, so this post is certainly not green, but it's still good! I have such a special place in my heart for Kay Thompson's Eloise. I'm pretty sure I used to make my mom read it to me on a daily basis. And although I was really young, I have such amazing memories (whole sections ingrained in my brain) of reading it with my mom over and over again. Luckily Avital is just at the age where she is starting to appreciate it (it takes some amount of attention span unlike other books with more vibrant pictures and the such). We can't get through the whole book in a sitting and I definitely push her to listen to more than she wants as I always want to read more, but it's still so fun to read to my daughter what I most loved to be read to as a kid. and they say "Yes, Eloise?" I usually yawn out loud several times"
Ok so I quoted a bit more than planned, but it's just so funny! All of you out there (with kids or without) should go pick up a copy and read it when you need a little pick me up. It's guaranteed to make you smile!